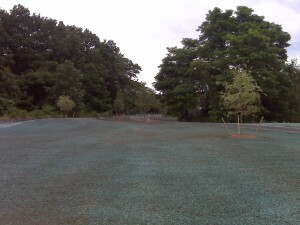 Hydroseeding is a very economical way to establish a lawn or stabilize any area that is subject to erosion control. It is very important these days to keep any un-stabilized areas from eroding due to rains. Siltation can occur downstream from the area and fill drainage ditches, catch basins and wetlands with silt causing harm to wildlife and nature itself. 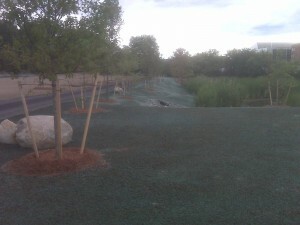 Other erosion control practices generally used in conjunction with hydroseeding are the use of erosion control matting, straw and hay mulching, tackifiers added to the hydro-mix slurry and sprayed on to necessary areas, silt fence and outlet protection devices at all drainage structures.